Monaco has its round the houses racing, Macau has its famous round the houses races, Valencia built one this year and Singapore spent a zillion on having its own night races around the houses for the F1 GP this year. Not to be outdone, Thailand has its own round the houses event, and in fact this is the second year it has been held at Bang Saen. As opposed to the daylight meetings at Monaco, Macau and Valencia, and more in line with Singapore, the local Bang Saen event was also in the dark (or partial darkness!). The circuit is through the streets of Bang Saen, lined by Armco fencing on both sides. It is extremely twisty and very narrow in places, even down to single file through the hairpin at the foot of the mountain. It is also extremely unforgiving as there are no run-off areas and one mistake wins you a wall. 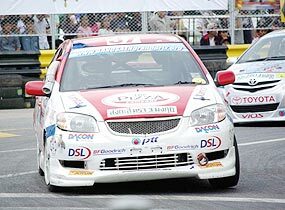 The Saturday and Sunday races were sprint races covering many categories, including the Toyota Vios One Make Race, Toyota Yaris One Make Race, Toyota Vios Lady, Super 1500, Super 1500 Open, Super 1600, Super 2000, Supercar, Super Commonrail Pick-up trucks, Mini’s and ‘Retro’ cars. However, it was the Friday’s Six Hour endurance race which attracted most entries, including some cars from Hong Kong and Japan, plus a smattering of overseas drivers in local cars as well. With sponsorship from AA Insurance Brokers, I was able to get nomination as one of the drivers in the two car Pizza Company team for the Six Hour, with Tony Percy and Thomas Raldorf in the Toyota Yaris and Paul Kenny and myself in the Toyota Vios. It should be pointed out that these were not standard cars, but highly modified and running slick racing tyres. The regulations for the Six Hour event stated that neither of the two drivers could remain behind the wheel for more than 40 minutes, meaning that there were frequent pit stops to change drivers. You were also not allowed to refuel before two hours had elapsed, and then again at the fourth hour. 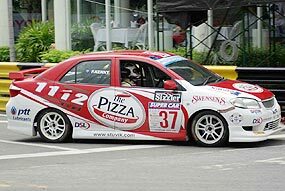 The Pizza Company team had mixed fortunes, with the Percy/Raldorf Yaris suffering a drive-shaft problem and then a brake failure, hitting the wall and putting them out of the race. The Vios was also in trouble with brakes, going through three sets of brake pads in the six hours. When the pads wore down, it was very difficult to stop and I found myself entering the pit turn too quickly and I also nicked a wall, but was able to continue with just a broken headlight and minor body damage. We also had problems with running out of fuel before the stipulated two hours and had to come in on the end of a tow rope mid race, having run completely dry. With the event having started late (can nothing in Thailand ever run to time?) the finish was also late and after sun-down and it was then that it began to look like Singapore night race, except there was no overhead lighting! Finally, in the dying moments of the race, two cars managed to invert themselves at the top of the mountain blocking the track and the race was red-flagged and declared at that point. Paul Kenny and myself and the slightly battered Vios were classified as finishers, but at the time of making this report we are unsure of our final position, but I imagine we would have come around 10th. My thanks to AA Insurance Brokers and Thomas Raldorf and Paul Kenny from the Pizza Company racing team for making the drive possible. Last week I mentioned that the winner of the Chinese GP received an extraordinary trophy which looked like a collection of Citroen grill emblems - the reversed double chevron. Forgetting about why the Chinese chose such an outlandish design, I asked why did Andre Citroen choose the double chevron for his cars? It was to represent the double helix silent gears pioneered by Andre Citroen before he began building cars in 1919. So to this week. What was the first Japanese car to be exported? Clue: it was to China. 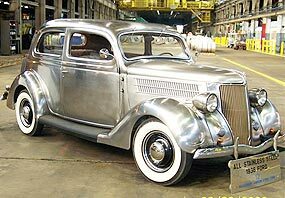 This is the 1936 Ford Coupe built for and owned by Allegheny Ludlum Steel. This is one of only four in existence and is the only one currently in running and in roadworthy condition. The car is in exceptional condition, with the interior and even the frame looking great. All four cars each had over 200,000 miles on them before they removed them from service. These cars were built for Allegheny as promotional and marketing projects. The top salesmen each year were given the honor of being able to drive them for one year. The v-8 engine (max 85 hp) ran like a sewing machine and was surprisingly smooth and quiet. I have always considered car electrics to be a black art. Take the battery in your car, for example, and I am sure you have all experienced the following. You have a perfectly good battery which is just over 12 months old. In your mind that’s almost brand new. In fact, you can even remember how much you paid for it, so it must be very new. And then one morning it won’t turn the engine over. It worked perfectly yesterday, you drove it home and now it won’t, or doesn’t want to turn the engine over. So you push start the car and run it for half an hour, as you suppose you must have left the headlights on, or something equally as explicable. Turn it off, and hey presto! It’s still as dead as a dodo. If you are really into masochism, you borrow your mate’s battery charger and leave it on all night. Triumphantly you remove the cables and jump in. It doesn’t work. Perfectly good one day, completely cactus the next. Explain that one, Thomas Edison. I haven’t finished with electrics yet. There’s the fuel pump on the original Mini’s, made by Lucas, the same people who made headlights, earning them the title of the Prince of Darkness. In a fit of madness, Sir Alec Issigonis decided to put the fuel pump under the floor of the boot. I personally think he forgot about it during the design phase, and the pump and its subsequent placement was an afterthought after the engine wouldn’t fire. Oops! No petrol. Oops! No pump. Now if the pump had been carefully wrapped in its own pump-sized condom, everything would have been fine. But it wasn’t, was it? Puddles, streams, overflowing Bangkok klongs, or a decent spit, would cause the pump to stop. OK, OK, water in the points, so the electrical pulse doesn’t, or something. Whatever, the end result is that you are stranded. Actually I have had a life-long hate of fuel pumps. Remember the old MG TCs? The pump was mounted on the right hand side of the scuttle firewall. Whenever it stopped ticking you had to get out, and perform black magic to get it to work. You unscrewed the cap and gently coaxed the points back into flutter mode, then reassembled everything and away you went. I had another method, which did not require you to stop at the side of the road or unscrew anything. I used to keep a short iron bar down beside the driver’s seat and when the pump stopped pumping, I would lean out with the bar in my hand and beat buggery out of the pump. It would start again, either because I had made the points open and close, or because the pump was so frightened it was trembling. Of course the sides were off the bonnet (‘De rigeur’ in those days, complete with leather straps across the top bonnet panels) to make it easy. Can’t afford to own that Ferrari? Here’s the answer! With the world in financial melt down, sales of new high performance sports cars have taken a nosedive. Top Gear TV show highlighted the fact that upper level car depreciation is at an all time high, with the value of the cars dropping to 50 percent in just one year! However, with luxury still in demand there is a way to drive your dream car other than shelling out a small fortune. Discerning drivers are currently defying the credit crunch and hitting the fast lane anyway through the British high performance sports car club, Marque II. Offering a selection of the most exclusive high performance sports cars, Marque II has become the sensible choice for every wise car connoisseur. 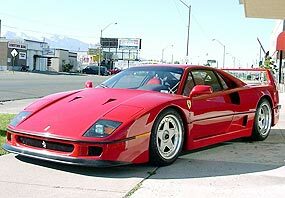 The current range of luxury cars available are Audi R8, Maserati Granturismo, Ferrari 360 Spider, Mercedes SL55 AMG, Maserati Gransport, Jaguar XKR, Range Rover Sport Supercharged, Audi RS4, Noble M12 GTO, Mini Cooper S Works, and I am sure something out of that lot would suit Sir or Madame this weekend! In the UK, the average cost of owning a high performance sports car can be a whopping 825,000 baht or more per annum let alone the outlay of buying one outright and the rampant depreciation! Joining a high performance sports car club like Marque II removes these costs and the stress of buying or selling cars, making it easier to enjoy the benefits of driving a high performance sports car without the headache of maintaining it. Driving within Europe, including delivery and collection anywhere in the EU. It all sounds just that little bit wonderful, but the concept is right. Why buy a Ferrari when you can rent it at weekends instead? From the customer point of view, the mathematics are right, and will save you money. So now, who wants to start one here?